20 years ago, you wouldn’t be traveling to the destination for this episode. Northern Ireland – and specifically Belfast – was ground zero for a nationalist conflict known as The Troubles, a decades-long bloody conflict between Loyalists determined to defend their British heritage, and Republicans seeking a united Ireland. But since the late 90’s, Belfast and Northern Ireland have changed, and our guest today is the perfect person to walk us through that evolving peace process. Paul ‘Donzo’ Donnelly is a history teacher by trade, but that barely scratches the surface. He’s been a mediator between Loyalist and Republican groups in Northern Ireland, working on dialogue projects between Loyalist and Republican ex-prisoners to help facilitate peace since the ceasefire. 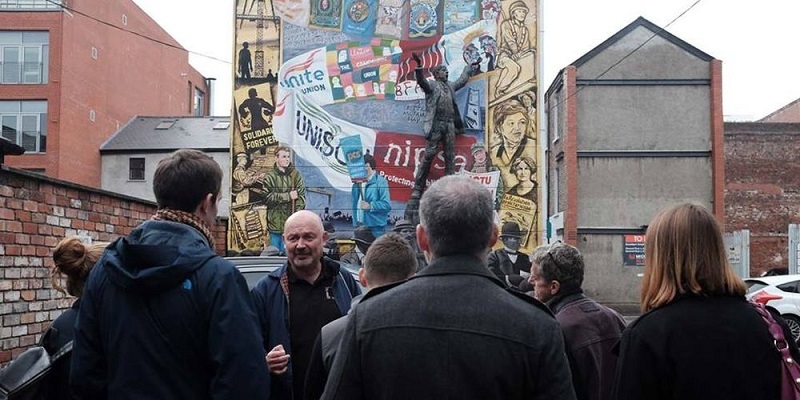 Donzo now leads Dead Centre Tours – Belfast’s #1 walking tour – taking participants first-hand through the history of The Troubles, while including the other cultural elements that make Belfast as unique as it is edgy, from sports to punk rock. 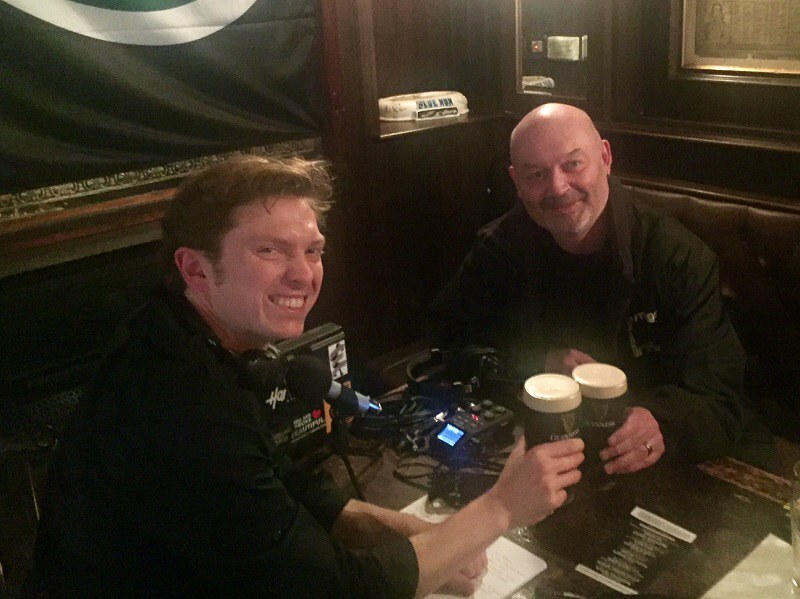 I met up with Donzo at The Garrick Bar on my latest Europe trip, an old Victorian-style Irish pub near Belfast’s City Centre. Grab a pint of Guinness, and pull up a chair for this big conversation. This Belfast mainstay has been operational as a bar since 1870, right in the center of downtown. From the Victorian stylings to the fireplace to the well-poured Guinness, whether you’re one of the after work regulars or a sports fan that’s there for rugby and horse racing on the weekend, you’ll have no doubt you’re in a proper Irish pub as soon as you step inside. Donzo starts us off with a bit of his background as a history teacher, mediator, and tour guide, as well as a quick overview of The Troubles in Northern Ireland. Northern Ireland was in a state of violent conflict from 1969 to 1994 until the first ceasefire. The peace process was formalized via the Good Friday Agreement in 1998. Donzo discusses some of the tangible improvements in Northern Ireland since the peace process began, including reduction in unemployment and a spike in global tourism. He goes on to describe how life has changed in Northern Ireland for families that have been there for generations, and how the process of peace in Northern Ireland is an evolution, not a revolution. We wrap up Round 1 discussing how Belfast has developed since The Troubles, and some travel tips for Northern Ireland. Donzo shares a story about his kids, and how certain regions of Belfast that were once hotbeds of conflict have become the hip parts of town. We discuss punk rock, and how the crossover of the different groups at the old Harp Bar were one of the first examples of countercultural movements bringing people together in Belfast. While Northern Ireland and Belfast are now perfectly safe places to travel, they still have a bit of a dynamic edge to them, making them very engaging places to visit. We talk about sports, rugby, and how other sports have played a role in unification and division in Northern Ireland. The Crown Bar – A beautifully ornate Victorian bar that’s owned by the National Trust. One of the most famous in Belfast. DeadCenterTours.com – DC Tours run several Belfast walking tours, including A History of Terror, the No.1 walking tour in Belfast. Officially graded as ‘Excellent’ by Tourism Northern Ireland, the tour has also won TripAdvisor’s Certificate of Excellence for four years in a row, while the company has been named “Belfast Tour Company of the Year’ for 2018 by the Luxury Travel Guide. Make sure to check out DC Tours on TripAdvisor. Make sure to give them a follow on Facebook, Twitter, and Instagram as well. 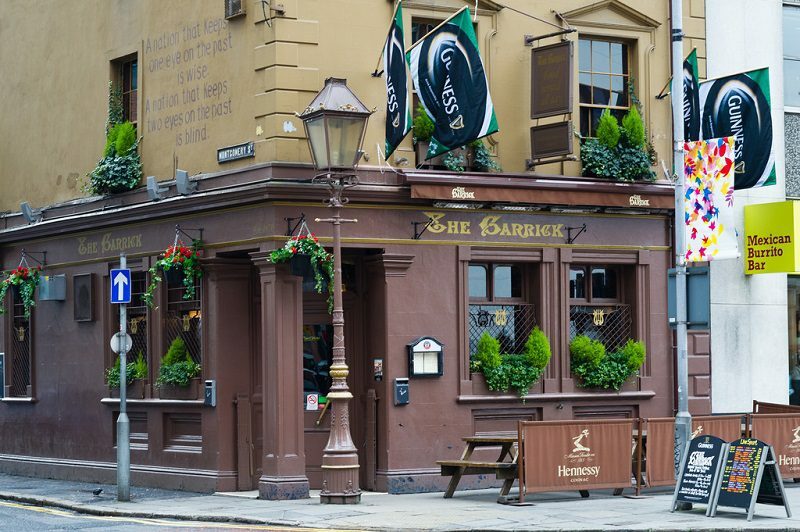 The Garrick Bar is located at 29 Chichester St, Belfast BT1 4JB, UK. Bar hours are 11:30am to 1am Monday through Saturday, and 12:30pm to 12am Sundays. Tortuga Backpacks are the makers of boutique travel backpacks that are perfect for any trip: functional enough for backpacking around Europe, classy enough for business. The just released their new Setout pack, and their Outbreaker bag is still my go-to pack for all of my travels. It’s the max size luggage for the overhead bin so that I never need to check a bag (unless of course I’m traveling with beer!). You can hear more about their story from Co-Founder Fred Perrotta way back in Episode 2. “Alternative Ulster” by Stiff Little Fingers. They’ve been “Putting the ‘FAST’ in ‘BELFAST’ since 1977.” Check them out at slf.rocks.